Just in time for Easter, this fun feature starring Emma Roberts (Scream 4 and Valentine’s Day), Sara Paxton (The Last House on the Left and Malcolm in the Middle), and Joanna “Jojo” Levesque (Hawaii Five-O) is the perfect movie for any family to enjoy. It's the end of summer and Claire (Roberts) and Hailey (JoJo) have a major problem. In just five days, Hailey's family is moving halfway around the world! These girls need a major miracle, and they get one in the form of Aquamarine, a beautiful mermaid who washes ashore in a late summer storm. Sweet but clueless to the ways of romance, she offers to grant the girls one wish if they help her find the boy of her dreams. But when they attempt to reel in the cute local lifeguard, the result is something none of them expect and they discover that sometimes what you wish for isn't what you really want after all! 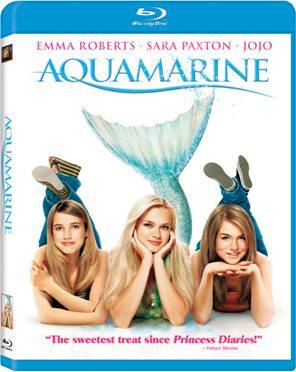 I got a chance to review Aquamarine on blu-ray. This wasn't my first time watching the movie. It first came out back in 2006 and I remember taking my younger sister and her friends to go and see this and I enjoyed it back then. Now, six years later I got to watch this movie with my daughter on blu-ray and she absolutely loved the movie. The whole mermaid part of the story really intrigued her, not to mention she thought the lead boy character, Raymond was cute. I found that the movie was much more clearer on blu-ray and much better quality then if you were watching it on DVD, which was nice. You can now enjoy this movie on blu-ray as it hit stores March 6th! Disclosure: All opinions are my own. I Aquamarine at no cost for the purpose of this review. No other compensation was received.